Bremerhaven, 22nd October 2012. The seabed in the Arctic deep sea is increasingly strewn with litter and plastic waste. As reported in the advance online publication of the scientific journal Marine Pollution Bulletin by Dr. Melanie Bergmann, biologist and deep-sea expert at the Alfred Wegener Institute for Polar and Marine Research in the Helmholtz Association. The quantities of waste observed at the AWI deep-sea observatory HAUSGARTEN are even higher than those found in a deep-sea canyon near the Portuguese capital Lisbon. For this study Dr. Melanie Bergmann examined some 2100 seafloor photographs taken near HAUSGARTEN, the deep-sea observatory of the Alfred Wegener Institute in the eastern Fram Strait. This is the sea route between Greenland and the Norwegian island Spitsbergen. “The study was prompted by a gut feeling. 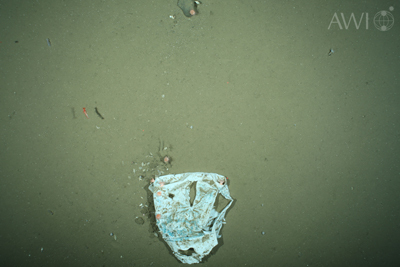 When looking through our images I got the impression that plastic bags and other litter on the seafloor were seen more frequently in photos from 2011 than in those dating back to earlier years. For this reason I decided to go systematically through all photos from 2002, 2004, 2007, 2008 and 2011,” Melanie Bergmann explains. Melanie Bergmann is unable to determine the origin of litter from photographs alone. However she suspects that the shrinking and thinning of the Arctic sea ice may play an important role. “The Arctic sea ice cover normally acts as a natural barrier, preventing wind blowing waste from land out onto the sea, and blocking the path of most ships. Ship traffic has increased enormously since the ice cover has been continuously shrinking and getting thinner. We are now seeing three times the number of private yachts and up to 36 times more fishing vessels in the waters surrounding Spitsbergen compared to pre-2007 times,” Melanie Bergmann says. Furthermore, litter counts made during annual clean-ups of the beaches of Spitsbergen have shown that the litter washed up there originates primarily from fisheries. The main victims of the increasing contamination of the seafloor are the deep-sea inhabitants. “Almost 70 percent of the plastic litter that we recorded had come into some kind of contact with deep-sea organisms. For example we found plastic bags entangled in sponges, sea anemones settling on pieces of plastic or rope, cardboard and a beer bottle colonised by sea lilies,” Melanie Bergmann says. When sponges or other suspension feeders come into contact with plastic, this may cause injuries to the surface of their body. The consequence: the inhabitants of the sea bed are able to absorb fewer food particles, grow more slowly as a result, and probably reproduce less often. Breathing could also be impaired. Furthermore, plastic always contains chemical additives, which have various toxic effects. “Other studies have also revealed that plastic bags that sink to the seafloor can alter the gas exchange processes in this area. The sediment below then becomes a low oxygen zone, in which only few organisms survive,” Melanie Bergmann says. Plastic, and what to do about it is an ungodly difficult problem. It permeates every part of our lives and it is so pervasive that it is almost impossible to eliminate from your life–even if you REALLY want to. As with many things, probably the only solution is a hefty (get it?) plastic tax that would force consumers and manufacturers to consider substitutes (hopefully recycled and or/biodegradable) wherever possible. And to charge households for garbage (which is a great idea anyway) so that there is a much more powerful incentive to recycle. We most commonly hear about plastics in the Pacific Ocean, because it gets swept up and suspended in the Great Pacific Garbage Patch (otherwise known as the North Pacific Gyre). But that doesn’t mean it is not worth learning more about what is happening there. So it’s worth checking check out this documentary, called Into The Gyre. Into the Gyre is a 44-minute documentary about a groundbreaking expedition to study the location, extent and effect of plastic pollution in the North Atlantic Gyre. Thirty-four volunteer researchers, scientists and sailors participated in this five-week expedition to the Sargasso Sea, east of Bermuda. Sailing on the 135-tall ship Corwith Cramer, operated by the Sea Education Association (SEA), Into the Gyre follows the team as they collect, count, and archive the plastic they find in the gyre. Along the way, the film examines the history of plastic, the adverse effects it is causing in the ocean, and possible solutions to this problem.